You will not get wealthy teaching English in Thailand. If that is your aim you would be farther ahead to teach in Korea and Japan. The draw here is definitely not the money. Salaries at Thai schools depend on the type of institution (public or private) and the level of instruction (secondary or post-secondary). Since I was a volunteer, my salary was equivalent to that of a first-year Thai teacher with a bachelor's degree teaching at a post-secondary government school. As with most government institutions, the base salary is low - about 12,000 baht per month, or $400. This was not nearly enough money to live on in Bangkok, however, my school provided me with free housing and utilities, which amounted to 6,000 or 7,000 baht per month. They also assigned me 2 or 3 evening classes a week, which earned 4,000 to 5,000 baht per month in overtime pay. Foreign teachers who got jobs at the colleges on their own earned about 25,000 baht/month, but they also had to pay for their own housing, which can eat your expenses in a city like Bangkok. Private high schools such as Bangkok Christian College also pay about 25,000 baht. Chulalongkorn University, Thailand's pre-eminent educational institution, pays around 40,000. You can expect about 300 baht per hour at commercial schools. They usually have benefits such as health care, paid vacation, bonuses, and visa arrangements. Private tutoring is a lucrative way to teach English in your spare time - you can earn anywhere from 300 to 1,000 baht per hour depending on the client. 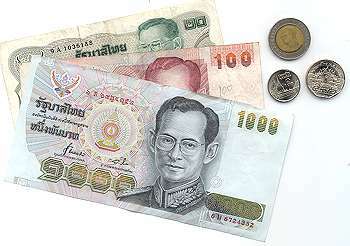 Teaching students pays about 300 to 500 baht, and teaching business people in banking or tourism pays 500 to 1,000 baht. These were the approximate rates for English instruction when I was in Thailand from 2001 - 2007. They have probably increased in the past few years.